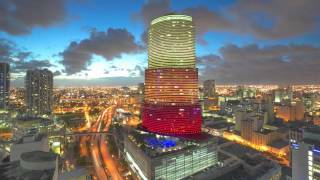 The iconic Miami Tower is a 47-story office building located in the heart of downtown Miami. This prestigious address is the home to many of Miami’s established and most influential firms. 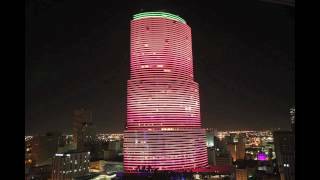 The building with its modern design is famous in the Miami skyline for its color-changing lighting scheme and has frequently been featured in films and television shows. Miami Tower used 352 large 1,000 watt (1,100 watts with ballast) metal halide fixtures located on the north, northwest and west façades of the building and in various setbacks on the 13th, 20th and 31st floors. The Tower also used 400 watt (465 watts with ballast) metal halide fixtures on the 46th floor. Creating the color effects on the building was costly and required a maintenance crew to use cumbersome and expensive gels. In order to fully light the exterior, building management also leased space on neighboring roof decks where they housed additional lighting fixtures at a cost of $110,000 annually. Jones Lang LaSalle (JLL), the building’s management company, knew it was time to investigate a new lighting system that was not only more energy-efficient, but would also allow the building to keep its visibility in the night skyline. Facility executives tasked Jones Lang LaSalle’s Energy and Sustainability Solutions (ESS) experts to seek a better alternative. The group called on LED Source® to help find a replacement for their 16-year old system. LED Source® recommended a Philips Color Kinetics LED lighting solution. The new LED lighting system would be more energy efficient and allow for the creation of custom light shows at the push of a button, without costly gels or maintenance processes. It would also allow the building management to house all of the lighting on-site, saving the yearly lease fee. At first, the JLL team was tentative about the new technology. To prove that the LED lighting system would provide more vivid lighting than the aging metal halide system, LED Source® produced a full 3D rendering of the building. They then invited JLL’s management and ESS team to see the capabilities of the proposed system in person during a test on the west section of the building. To further the case, LED Source® also worked with JLL’s ESS team to provide a cost comparison of the new LED system with the current system, which showed that the total replacement proposal would have an annual reduction of 807,688 kWh –including a savings of 91.9% annually in exterior lighting energy costs. In addition, JLL would subsequently save $259,767 annually in energy, maintenance and operating costs. The LED lighting system was unanimously approved and the 382 metal halide fixtures were replaced with 216 Philips Color Kinetics LED fixtures—168 ColorReach Powercore fixtures and 48 ColorGraze Powercore fixtures.